Get the low down on the most popular family of oriental trees known as the Japanese maple trees. The Japanese maple tree family is the most abundantly used category of trees in Japanese gardens. The extensiveness of the variety that exists within this category deserves an encyclopedia in its own right. 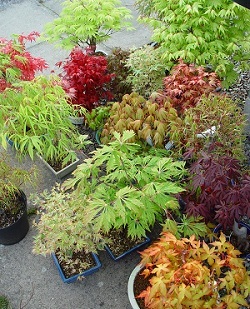 The aesthetic brilliance coupled with the easy planting and propagation of the Japanese maple tree family makes them a popular choice for Japanese gardens. The Japanese red maple tree is perhaps one of the most popular variations from the family. Known as the Acer Palmatum Asutropupeum this tree can be grown from seedlings and then grafted into different varieties. The nature of the red maple tree makes it an easy to grow tree right from scratch. Of course one needs to know how to handle the seedlings prior to embarking on the mission to grow their own red maple tree. On blossoming the red maple can work wonders for your Japanese garden. The highlight of the red maple is of course the red colour of its beautifully designed leaves. The added greatness of this particular tree is that it retains its red colour almost throughout the summer season. The weeping maple known as the Acer Palmatum dissectum Tamukeyana in the world of botany and is more commonly known as the lace leaf maple Japanese maple in general. The tree is admired for its purple colored foliage which experiences a transition towards red with the advent of winter. This particular tree can grow up to a height of eight feet and can spread well over 10-12 feet. The weeping maples are known to be tough and resilient to different weather conditions. One of the things that attracts people to using this tree in their garden is the fact that it is earliest to blossom at the coming of spring and amongst the last to shed its leaves in autumn. Hence the weeping maples bring life to the Japanese garden for an extended period of time. Any maple tree that does not extend any further than six feet from the ground above is classified as a dwarf maple. It is not as if dwarf maple trees are another variation of the maple family rather it is just a category of small sized cultivars that are derived from the wild Japanese maple trees. There are many different dwarf trees such as the Beni hime which has gained immense popularity over the years. This is one of the dwarf varieties that are actually quite rare because it is difficult to locate. An average Japanese maple tree can shoot up to forty feet high. The smallest of the dwarf maples will not exceed a maximum height of 18 inches and can actually be grown as a bonsai in a container. The compact dwarf trees do not require any pruning or clipping like the ordinary maple trees because their growth is so sparse and slow. Nonetheless they have a magnetic appeal with regards to their delicate beauty.